Summer is a great time to try something you haven’t tried before! Is there a park near you that you’ve heard people talk about, but never actually gone to? Have you ever driven down a road that has a sign saying that there’s a park that-a-way, but never followed the arrow to check it out? Have you looked on a map, and said “there’s a park in that neighborhood? I never knew!” Now is your chance to check them out! To find out more about your local parks, search online on the websites for your city, your county, your state, and national parks websites. (Or look on an old-fashioned paper map!) Most will have directories of camps, with listings of what amenities are available at each park. You can also check Yelp and other online review sites for reviews of local options. For YEARS, I have heard about the playground here. (See pictures above and this article) It was built in 2003, just when my daughter’s were growing out of playground age. It was a community project – kids from 7 elementary schools and some scout troops dreamed up ideas, and adults worked together to design it and make it happen. They built it with all volunteer hours and donated funds from individuals and companies. I’ve heard for years about how great it was, and we finally went. My son LOVED it. He ran through every square inch of the playground, played on the slides, explored the sandbox, played on the marimba, and so on. Very big, diverse, interesting playground, well worth going back to. Only strike? It’s big, and there’s lots of places in it where it’s hard to see your child. If you had multiple children, there’s no one place you could sit and keep an eye on them everywhere. So, this is definitely a play-with-your-kid or follow-your-kid playground, not an “I’ll just sit here and read Facebook while you play” playground. There are also hiking trails and waterfront here… we’ll have to check those out the next time we go. On our way out of St. Edward’s park, I noticed again the signs I have noticed for years for “Denny Park.” We decided that the next time we wanted to go to a park to check it out. When we returned, we went on the hiking trails which was a nice and slightly challenging hike – the three year old wasn’t with us, but I think he would have struggled a bit with a couple of the hills. After the hike, we walked along the water. This is a Kirkland beach park with shade by the water (!) and without crowds. It’s nice to know there’s this option for the hot sunny days when you know Juanita Beach and Marina Park will be mobbed. If you read reviews (like on Yelp), they’ll say there’s no playground and that the second parking lot is a potholed dirt lot. Neither of these is true now. There is a new playground there, which is pretty good (not as good as St. Edward’s…) and the back lot is now paved. Note: O.O. Denny Park was willed to the City of Seattle in the early 1900’s. It appears to now be operated by City of Kirkland and/or the Finn Hill Neighborhood Alliance. Then on the way home from Denny, we saw the signs for Big Finn Hill (a King County park), which again, we’ve seen the signs for years and never gone. So, this was next on our list. We planned a hike in the woods on a hot day. We didn’t realize there was a playground till we got there, but of course our son had to try it out before (and after) the hike. We followed the trail maps and it was a great opportunity to practice Left and Right skills with our son, asking him “we need to turn left, which way is left” Nice trail, very manageable for a 3 year old. Nice range of plant life, lots of animal dens, and one baby bunny spotted. 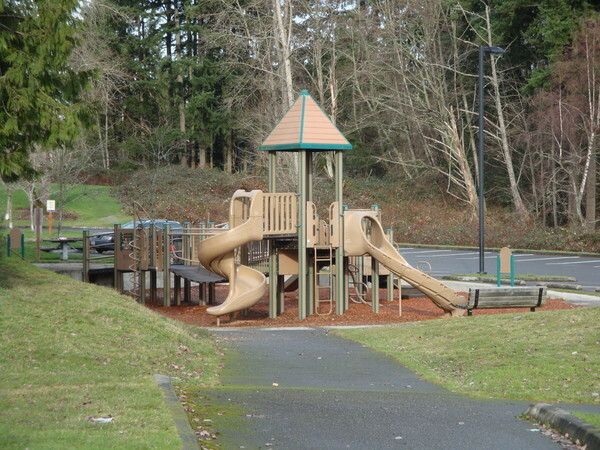 Toddlers and preschool age kids are happy to return to the same park over and over again, but for me as an adult, it’s nice to discover something new… So, check out some new parks in your neighborhood! 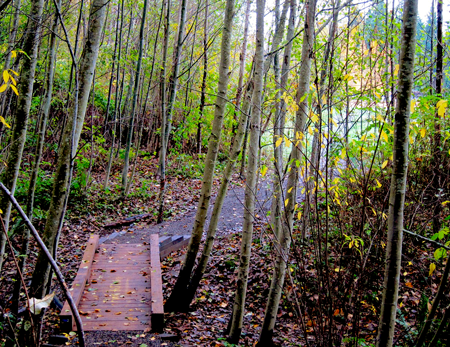 Here’s links to posts I’ve written about other local parks: farm parks – Farrell McWhirter in Redmond and Kelsey Creek in Bellevue, dog parks at Marymoor, Robinswood and KDOG; turtle watching at Juanita Bay Park, stumps to climb on at Peter Kirk and Bridle Trails, Woodland Park in Seattle, and wading at Everest Park in Kirkland. To get more ideas for “cheap dates with toddlers” (most have specific details for Seattle area folks, but hopefully there’s useful ideas there for non-locals too) just click on “toddler dates” in the right hand sidebar of the page.